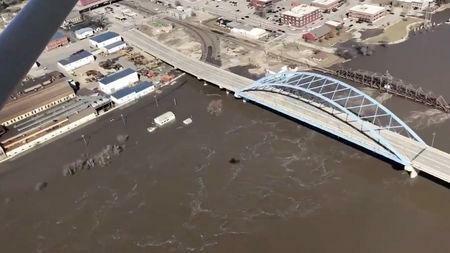 Although the surge had begun to recede in Kansas City, Missouri's largest city, a number of riverfront roads remained flooded and city residents were urged to conserve water to help utility crews cope with the deluge. "The good news is the river has crested and is now dropping," the Riverside Fire Department said on Twitter. "All businesses open," the city declared on Twitter. But the flooding still threatened Kansas City's drinking water. More than 600,000 customers in the Kansas City metropolitan area were asked to conserve water as flood-levels in the Missouri River created "treatment challenges," the city's water utility said on Sunday. "The water is very safe to drink ... but we are keeping an eye on it and taking extra samples," said Mike Klender, a plant manager for Kansas City's water services, at a news conference. Floods were unleashed last week after a "bomb cyclone" storm dumped torrential rains on hundreds of square miles (km) of the snow-covered Plains. "I think at the worst what it will do is just prolong the gradual receding of the water levels across the various river basins throughout the Midwest," Orrison said by phone from the service's Weather Prediction Center in College Park, Maryland. The record flows had cascaded down the Missouri, the country's longest river, killing at least four people, drowning livestock and closing dozens of roads in Nebraska and Iowa. Property losses were estimated at more than $3 billion in those two states.